This place lives up to its name. Make -a-Messterpiece in Glenview was the perfect place to get messy. We visited a couple months ago. There’s goop and paint and bubbles, and usually frosting and sprinkles. Staying neat and clean is not an option. Smocks (provided when you walk in the door) are a must at this kids’ paradise where messes are encouraged. The inside of the building looks like a gigantic science experiment with aluminum tubes, pipes and gadgets everywhere. From science and music to culinary experiments and of course art, Make-a-Messterpiece encourages kids to get creative in different ways and to use all their senses. With hands covered in sticky blue gunk, Julie and Johnny shockingly requested “to get clean”. We had just concocted a special slime, and they had gleefully squished and mushed the mixture, until they apparently had enough. Luckily there are plenty of sinks around the museum, as well as paper towels and hand sanitizer. Before the gooey slime incident, my kids created bubble paintings in the Bubble’ology department, decorated ice cream cones and pounded on drums to splatter paint on walls. They sculpted play-dough, created foam hats, and finger painted on butcher block paper. Families can easily spend a few hours at the museum happily creating messes. Though the total experience package can be pricey ($22 per kid), kids can still have fun and make a mess for the $10 admission fee, which doesn’t include the extra hands-on activities. ($5 for each extra activity). When I found out I was pregnant with Julie, I dreamed of pony tails and braids, ribbons and barrettes. Little did I know my little girl would care less about pretty hair. I have been fussing with Julie's hair since before she had hair. When she a baby, I loved putting headbands or bows around her adorable round head. Julie would angrily yank them out. As a toddler, Julie screamed horrifically if I so much as tried to brush her hair. This meant for a couple years her hair often looked a wreck. Once she was in preschool, I think Julie noticed other girls with hair in perfect braids or buns or pigtails. So, occasionally she'd let me do her hair. Those were moments I loved---just brushing and braiding and putting pretty little bows in her hair. And she always looked so darn cute. Over the years, Julie has gotten a little better about hairstyle. She'll sometimes want a cute side pony tail or headbands, or on special occasions, she'll actually let me curl her hair. If she had it her way, though, I still think she'd walk out of the house with bedhead every morning---which is not an option. 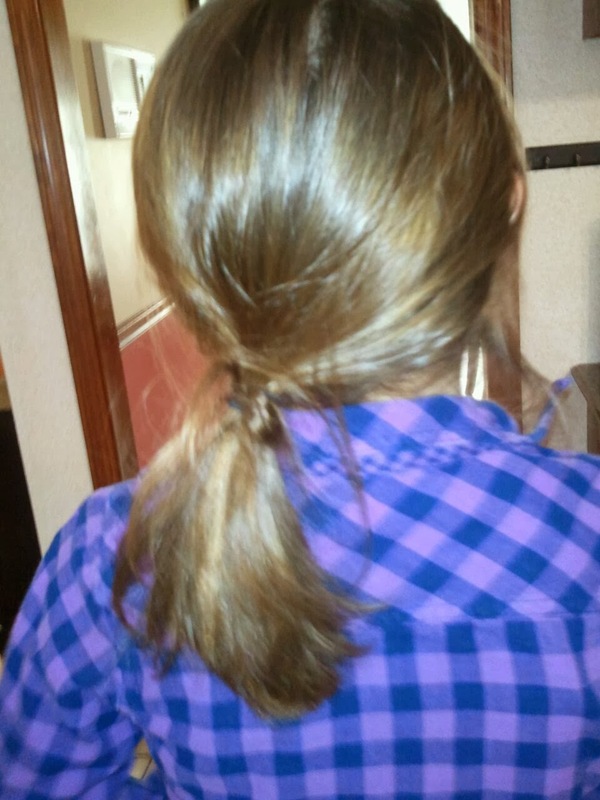 Today, for the first time, she proudly put her hair into a ponytail all by herself. I didn't have the heart to tell her it looked not-too-great. I was so tempted to fix it...just at least pull out the stray pieces or brush the sides, or put in a barrette to keep the bangs out of her eyes. But, I stopped myself. This was a little bit about her growing up with confidence. She had tried something independently that she has told me a thousand times she "can't!!" do. Finally she does it. Why would I crush that? I know...deep thoughts for a ponytail. But, I think it's important to let her accomplish things, even if the end result is imperfect. Why would she ever want to try again if she thinks she can never get it right? If you're looking to for a good time with or without kids Hofbrauhaus in Rosemont is a great bet for dinner and drinks (very large drinks). No stuffy restaurant here. Hofbrauhaus is loud and fun. Hyper kids don’t seem to faze the servers, and the performers encourage crazy audience participation. We visited a few weeks ago on our little Rosemont staycation. The large German pretzels with a bevy of dips was an awesome appetizer, which Scott and I washed down with German beer brewed onsite. Then, there was schnitzel, and wieners and strudel. All of this was consumed while we danced, sang, clapped, cheered, clinked glasses and enjoyed one of the most entertaining performances we’ve experienced while eating dinner with kids. I thought I knew winter. Growing up in Maryland it meant a few snow storms, some days off school, and a couple months of chilly weather. When we moved to Pennsylvania, winter meant more snow, colder weather and hardly any days off school. But, I truly did not know a thing about winter until this year in Chicago. The snow is nonstop. We're constantly shoveling. The ground is permanently white. We haven't seen grass since November. Negative temperatures are a weekly occurrence. If you haven't experienced negative 25 degrees, you have no clue. I'm not even talking wind chill. I'm talking straight negative 25, with a wind chill of negative 45 or 50. That stuff stings. People here are tough. They know winter. There's no days off school for snow or ice. The roads are completely cleared before 6 a.m. Kids play outside for recess every day for school (as long as the temperature is above 0) and they like it. They are expected to wear snowsuits and that's that. Everybody know the rules, regardless of how ludicrous it might seem that our kids are frolicking in the snow when its 2 degrees outside. I have to admit that winter's fury has made us all tougher. We don't fret over a few inches of snow. Actually we kind of like it. And 30 degrees seems like summer. Saturday it was 20 degrees. We strapped on our snowsuits and boot and played at the local park like it was springtime. We slid down slides and swung on swings and chased the puppy around in the snowy field. Today we set up a bonfire in our backyard. Easily two feet of snow covers our backyard. But we all set up our camping chairs on the frozen ground, huddled around the fire and roasted marshmallows. My very favorite red high heels=chew toy. But, the most egregious act of all: My Bear Bear=completely thrashed. I’ve had this not-quite-cute-anymore stuffed animal since I was 2 years old. I loved that raggedy bear. My mom had stitched his little arms and re-attached his eyes more than a few times. He was so well loved. Life with a puppy is definitely more than we bargained for. It’s like having another toddler—and some days I’d rather have a human toddler instead. He’s an adorable, sweet and snuggly little guy but he finds trouble, and requires tons of attention. Just like any other puppy (or toddler) .... I get it. Here’s little Chico sitting by the front door—patiently waiting for Julie to come home from school. And, the kisses and snuggles afterwards make it all worth it. Lincoln Park gets all the buzz, but the smaller lesser-known Lincoln Square deserves some attention too. As a Chicago newbie, I knew nothing of this charming little neighborhood until I met one of my best Chicago buddies who used to live in Lincoln Square before moving to the northwest suburbs. She often talked about the awesomeness of Lincoln Square, and finally convinced me to join her on a tour of her old stomping grounds last fall. My kids, Julie, 8 and Johnny 4 tagged along with my friend and her four sons (7, 6, 4, and 2) We fell in love with the place. It’s in the city, but feels like a small town. There are adorable cafes and restaurants, unique little shops, a world-class music school and plenty of fun parks for kids to run and play. In the summer, a fountain in the middle of square comes to life and sometimes kids jump in or at least splash around. And the downtown community hosts festivals throughout the year, bringing out droves of Lincoln Square-ians. I have lived in suburbia my entire life, but Lincoln Square makes me long for city living. Located in the heart of Lincoln Square, this French café serves pastries and sweets, but also delicious soups, salads and sandwiches. The kids and I stopped at this restaurant on a chilly winter day and warmed up with some homemade macaroni and cheese, vegetable chili and the moistest and sweetest corn bread we’d ever tasted. What a perfect location for an ice cream shop---just steps away from the awesome fountain I mentioned earlier. So, in warm weather grab a gelato and sit by the fountain. Ever try banana beet sorbet? What about rum raisin or roasted banana cashew heath crunch. Me neither, but Paciugo offers 200-plus flavors, some strange, some simply delish. This BYOB restaurant is a great stop for salads and pizza. The restaurant is only open for dinner, but it’s still fine for kids. The pizza selection is wide—with dozens of vegetable, cheese and meat topping choices. I could spend hours in this tiny shop browsing all the unique gifts, books, décor and trinkets. Chicago lovers will love the really cool and different Chicago memorabilia from maps to distressed-wood picture frames. One my favorite frames is bright red and says “To the Moon and Back.” Adorable. And, the store cracks me up. There are usually a handful of things I find that are hilarious---like a tongue in-cheek book for kid called “How babies are made” or “ Good Night iPad” (a parody of the classic children’s book.) There are fake mustaches, Abraham Lincoln bandages, bacon air freshener, Gingerbread men cookie cutters with different body parts missing and little gifts that you just hope your kids don’t see. Julie found a tin of lip gloss that said “Lip S*****” and she asked what that meant. Oops. I still love the store. Julie and Johnny were a little shocked when they scarfed down a bite of ginger, which I’m sure they assumed was a candy of some sort. Customers are invited to taste any of the spices in the shop, which can be fun, until kids realize it’s not “real food.” But the spice collection is pretty impressive. We left with a barbecue rub and a “blue cheese” seasoning which the kids really like. The store sells pretty much any spice you might be looking for, and is also a great stop for gifts. About a half mile from Lincoln Avenue (still walkable with kids in nice weather), is Amy’s Candy Bar---a cute, yet tiny candy shop. Sweets of many colors and shapes overwhelmed my kids. They didn’t know what to choose! I think they were still in shock that I was actually letting them pick out any candy in the store. Julie chose pink strawberry-flavored gummies and Johnny chose candy-coated marshmallows. The homemade pierogis and specialty meats (venison, bison, rabbit and boar are among the more unusual choices) are worth a stop. The shop is also entertaining to browse with kids. Julie was a bit grossed out by the octopus salad, but intrigued that the store sold ostrich meat. At the corner of Lincoln and Montrose avenues is the 15-acre Welles Park. With playgrounds, spray parks, horseshoe pits and sports courts, the park offers something for everyone. While residents frequent the fitness center and gymnasium in the winter, the park really comes to life in the spring and summer when families flock there to picnic, play and enjoy outdoor concerts. Anyone who knows Lincoln Square knows about the Old Town School of Folk Music. This gem of music and arts seems to anchor the neighborhood. It was founded in 1957, though it didn’t move to Lincoln Avenue until 1998. Since that time, the Old Town School of Folk Music has been catering to people of all ages and talents. There are dozens of kids’ classes ranging from piano, guitar and art to dance, theatre, ukulele and banjo. There are also an assortment of “Wiggleworms” classes, which encourages young kids (babies to 3) to dance, sing and play. Even the older kids can enjoy fun classes like story time dance, comic book drawing and musical theatre. I finished my quest for amazing Mexican food for Chicago Parent Magazine at a restaurant which truly defines Mexican fare. It’s impossible to write a story about Mexican restaurants in Chicago and not include Nuevo Leon. This is the real deal. The authentic Mexican restaurant is an institution in the heart of Pilsen. Johnny and I visited the nearby National Mexican Museum of Art before devouring lunch at Nuevo Leon. Before our entrees, we noshed on the fresh salsa, guacamole and chips, and were treated to little plates of small meatballs and papas (potatoes). For lunch, I ordered chicken and bean tostadas topped with guacamole, lettuce and cheese and Johnny opted for the cheese quesadilla. Portions were big, but we couldn’t resist trying the flan, which was scrumptious. He spelled out "I love you" in jolly ranchers on his bed. It was our very first Valentine's Day. Scott and I had only been dating since November and he went all mushy gushy. He gave me roses and a teddy bear and picked out a beautiful heart-shaped necklace. But the jolly ranchers got me. I just thought it was the sweetest, and I couldn't believe that someone actually felt that way about me. It's hard to imagine, but not only is Scott the only person I ever loved, he was my first real boyfriend. There were crushes and flings. Dates and dances. But Scott was the only guy I had really fallen for. And, he fell for me too. It was a whirlwind romance. Yes. Cliché. I know. But it was. Really. We couldn't spend enough time with each other. And seven months after we met he proposed. Everything seemed to happen fast with us. We were married, and then Julie was born on our second anniversary, and then we moved to a new town and we had Johnny. Somehow years passed, and here we are married for a decade with two not-so-little kids. In the busy days of living life, it's easy to forget about each other. It's easy to not remember what it felt like to snuggle on the couch and watch "Alias", or how nice it was to hold hands just walking around the block, or how competitive we were and how we tried to beat each other in Scrabble or Rummikub or Mastermind or ping pong. To get caught up in life---that's the easy way out. To take time and dig deep to remember the love isn't always easy but there's no other way to live. That's why the card this morning meant so much, and the handwritten note he mailed to me while he was traveling was just enough to say he was thinking of me. And the flowers delivered to our door after lunch weren't really necessary after 10 years of marriage. But he's my first love....and my last. And that's how it will be. Today Johnny walked into his preschool classroom to find most of his friends with crazy hair, mismatched shoes or backwards pants. Yikes. It was Wacky Wednesday. I totally didn't get the memo. I frantically tried to convince Johnny to turn his jacket inside out or put his shoes on the wrong feet (anything wacky!). He wasn't having it. "It's hard to keep track of everything," one mom commented sympathetically (I think...) as she watched my frenzy. Really? Did she just say that to me? This isn't me. This is the opposite of me. I love Wacky Wednesday! I used to be the mom who planned for weeks how to make their kid look the wackiest. How the heck could I mess this up? I've never once forgotten a Wacky Wednesday or Freaky Friday or Silly Hat day or School Spirit Day or Red Ribbon Week. I know when it's library day and that Julie should pack sneakers on Mondays and Fridays for gym, and that on Wednesdays Johnny should wear shoes with laces so the kids can practice tying shoes. Every other Thursday is Girlscouts followed by dance class, and Johnny has swimming on Wednesdays. Tuesdays are piano lessons and Wednesdays are spelling tests. I've got this Really. I'm good. But I forgot Wacky Wednesday. You know...those lists everyone made in school? And if you weren't the ones making the lists, you at least saw them, or maybe your name appeared on the list somewhere. Sometimes they ranked the kids in your class. Cutest to ugliest. Smartest to dumbest. Nicest to meanest. Most popular to least popular. Or sometimes they were kind of like superlatives. Most likely to be a doctor. Class clown. Prettiest. As a parent, I didn't think I'd set eyes on a list until Julie and Johnny were in middle school...or at least upper elementary. This is what I found in Julie's backpack last week. I was in shock. "Best. Middle. Worst." Was she ranking the kids in her class? Was she the mean girl? 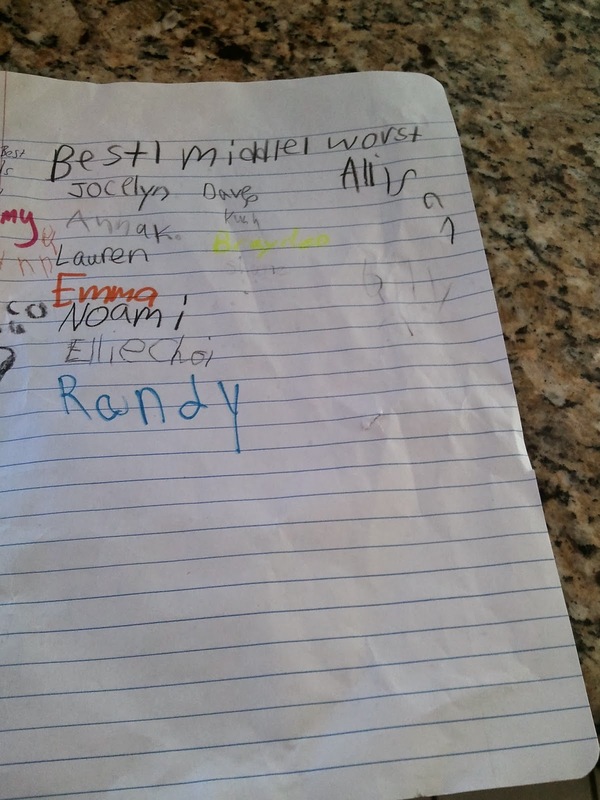 What second grader lists her classmates under those categories. Then, I quickly realized the kids had signed their own names. They had decided where to put their names. And Julie explained she wanted kids to write whether they were her best, middle or worst friends. Now that's just asking for someone to hurt your feelings. "I just thought they might all put best," Julie told me, explaining she was a little sad one classmate had decided she was her "worst" friend. I told her the girl was probably just being silly. But, secretly I was kind of pissed. What girl puts "worst friend" on my daughter's list? Sure, she was asking for it. But, that's BS. Then, I explained to Julie that listing people or friends is pretty much always a bad idea. And, when she wasn't looking, Scott and I made another category "Super Best Friends" and we wrote our names underneath. Date nights are fun, but double date nights are sometimes even more fun...especially if you ask along an awesome couple. Friday night Scott and I went out to dinner with our neighbor friends and it was a blast. They introduced us to this amazing little Italian restaurant in Long Grove--about 10 minutes from our house. My favorite part of the meal---super soft and warm bread to dip in a plate of fresh garlic (heavy on the garlic) and olive oil. Delish! The seafood with linguine was awesome too, and Scott loved his clams and linguine in wine sauce. And the atmosphere was wonderful. Very Italian and laid back, but also a place to go for a nice evening out. One of the most unique things about Enzo & Lucia is there are tables in the kitchen, so you can watch the chefs at work. I think that will be our spot on our next visit! Is it really time for that? This morning I snuggled with my Johnny, his Elmo clutched tight to his chest. Tonight I registered him for kindergarten. He was supposed to be my baby. I kind of assumed that would last forever....or at least a little longer. Why have these almost five years flown by when I can so clearly feel him in my arms as a tiny baby? When we brought Johnny home from the hospital, he loved lights. He refused to sleep unless the lights were on, so I would spend hours rocking him in the middle of the night with bright lights shining overhead. Oddly, I kind of cherished those times with him, maybe because I knew it was the last time I'd be rocking somebody in the middle of the night. Even in my sleep-deprived stupor, I remember not wanting to let him go. In these 4 1/2 years, I really haven't wanted to let him go. He's been my buddy. My baby. My little boy. Tonight Johnny told me he was too "wittle" to go to kindergarten. There’s a reason Rosemont’s new entertainment complex has been dubbed the “Mini-Mile“ a nod to Chicago’s famed Magnificent Mile. In the heart of Rosemont, MB Financial Park in Rosemont (www.rosemont.com) has plenty to offer from restaurants and bars to a luxury movie theatre, an upscale bowling alley and a comedy club,…not to mention it’s situated within walking distance from the new Fashion Outlets of Chicago. My family of four spent Friday night and most of Saturday in Rosemont for a little staycation. We stayed at Aloft (www.aloftchicagoohare.com)---a trendy, fun hotel steps from the restaurants and across the street from the outlets. Though Aloft would be perfect for a couple’s weekend away, the hotel was a fun family retreat. The indoor swimming pool was an immediate draw for our kids (Johnny, 4, and Julie, 8) and the lobby was filled with board games (Sorry and Jenga to name a few) to play by the fireplace. Ideally parents could sip a few cocktails at the bar while their kids played games. We, however, returned back to the hotel after a busy night, so we decided to head back to the room. First on our staycation agenda was a trip to the outlets. I was more than a little curious about the Tory Burch outlet, my husband Scott wanted to check out Under Armour and Julie and Johnny were begging to stop by the Disney Store outlet. At the Disney outlet we were just in time for an animation class where the kids were given Mickey Mouse ears to wear as they learned step-by-step how to draw Mickey Mouse. Of course we didn’t leave without buying a few stuffed animals. Julie and Johnny chose the adorable pea pods from Toy Story. Before leaving the mall, we couldn’t pass by Lolli and Pops. The colorful candy store was like a walk back in time to the old penny candy stores, yet, the store had an almost futuristic feel. Every room in the candy store is uniquely decorated and features a different type of candy. As we were given a special tour, the kids were treated to samples of pretty much any candy they desired. They had never seen so many variations of gummy bears, chocolate-covered pretzels and lollipops. And, what a wonderful feeling to simply walk back to our hotel room at Aloft after a night of dinner, drinks and dancing. Back at the hotel, we decided to skip the swimming pool and games, and just crash for the night. But, as soon as the kids woke up, they were slipping on their swimsuits. Breakfast was a ’la carte which was fast and simple. Perfect for our family because we were ready to swim and try out some of Rosemont’s other attractions. Following our dip in the pool, we decided to try Kings Rosemont(kingsbowlamerica.com)—which is unlike your neighborhood bowling alley. This place is hopping with partiers on weekend nights ready to dance and sing karaoke (on Fridays), but during the day families are welcome. We were treated to a couple games in a private room where we munched on some pretty amazing food. Steak salad, Cobb salad and fresh guacamole—nothing like your typically greasy bowling alley fare. 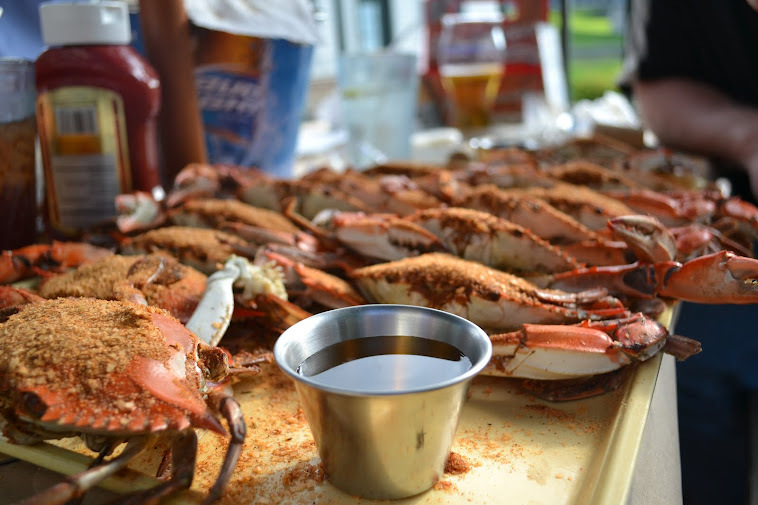 The menu even had fresh fish, frozen drinks and plenty of burgers, soups, sandwiches and appetizers. The manager said the slogan at Kings is “A restaurant with a bowling alley”---not the other way around. We would have to agree with that, though we gave the bowling two thumbs up. The entire staycation earned, in our opinions, five family stars. We will be back.